Oh hi pizza, we’ve been there done that before, eh? 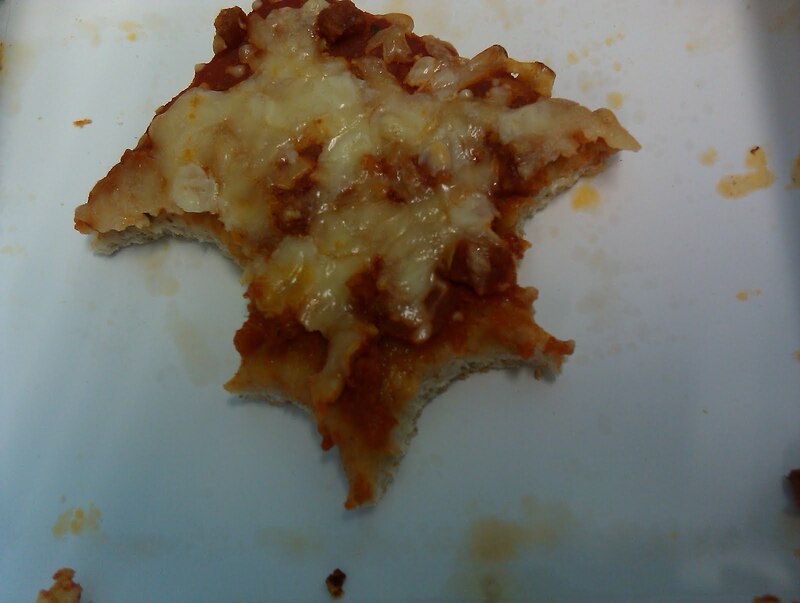 Remember when Brave New Lunch told us pizza like this has 62 ingredients? Oh yes, that was a revelation. So good, down to the last 62nd filler! Seriously though, the pizza is bland. In the Spring I thought that eating this much pizza at school would spoil it forever for me. But my taste buds rebounded and I did have pizza over the summer and it was ok. It has to have basil on it though or I’m out. The “bunny-luv” carrots!? Cute. It made me smile. I don’t remember having that packaging last year. The carrots are definitely a favorite of mine. Unfortunately one of you kind readers had to spoil them for me. Cliff notes: baby carrots are cut and processed from big carrots and the peel is where the nutrition is (who knew? )…also they are rinsed in chlorine, which is probably ok since I swam in chlorinated pools this summer with my toddler. Course I usually didn’t lick myself after my chlorinated bath… Anyway, down they went! And I drank the fruit cup. I don’t even bother eating the fruit when the best part is drinking the “juice.” Bottoms up! Yesterday I commented that I hadn’t had a quesadilla before and that was in reference to school lunch. I hadn’t eaten one at school before. Certainly I have eaten a quesadilla. In celebration of my successful completion of the first half of the project, I went out and bought myself a real Mexican taco lunch. I love to eat. Commenting on the quesadilla post one of you kind readers invited me to Texas for a real quesadilla and you’re on! I have never set foot in Texas (unless you count the Dallas airport for a layover). If I have occasion to visit, then we’ll have a real quesadilla lunch together. Homemade tortillas sound like something my soul needs right about now. Although my health report from June was actually pretty good after eating school lunch for six months (sugar went up but cholesterol went down), I did see an allergist in June because I was having some trouble breathing. I chatted with the doctor about my symptoms: every time I was getting sick, it was going to my lungs and sometimes I felt like I had trouble breathing. Allergy testing revealed a pretty severe dust allergy. At the time of my appointment I was actually sick and so they did some breathing tests and had me take some puffs from an inhaler. I could physically feel the difference in my chest as everything opened up. The doctor prescribed a rescue inhaler. I felt ambiguious about taking it, but I filled the prescription. My sister has had mild asthma since childhood. I never had trouble breathing until this year. So I have a little family history, but I couldn’t help but wonder, “Are school lunches making it hard for me to breathe? Is there a connection between processed foods and asthma?” Using Dr. Google, I found three small articles. They say that salt is bad for asthmatics. 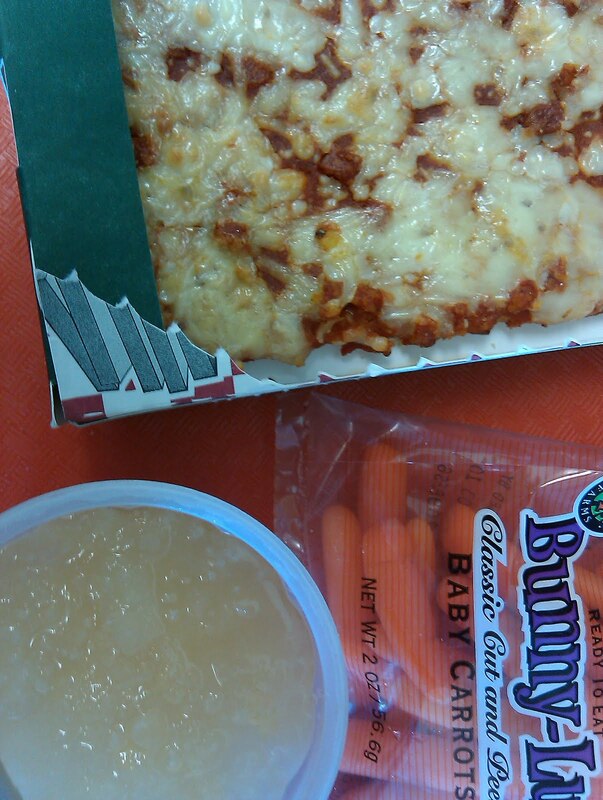 That is one aspect of school lunch not regulated by the USDA. What do you think? I’m probably overreacting. I’m sick already this week. Last night I had to open up the medicine cabinet and find that inhaler. So I used it for the first time yesterday and then this morning too. I hope I get over this quickly! Just a thought, but what sort of message is the cartoon pizza baker sending kids? Your drinking water is lightly chlorinated too. And after the carrots are LIGHTLY RINSED in chlorine, they're rinsed in potable water. It's a health thing. Like boiling water in the outdoors before you drink it. And the whole "they turn white after a while because of the chlorine" is false too. Regular carrots do that when cut and left to sit too. And apparently the baby carrot industry is spending millions in new marketing, trying to make them the new snack food. Awesomeness? I think so. When I moved to college from home cooked food to aramark provided dorm food my asthma went from irritating to incapacitating. I go to a very large school that requires you to walk long distances to class; I couldn't get to even the closest one with out losing my breath. I also realized partway through spring semester that I was 19 and unable to climb a flight of stairs. At that point I started eating salads whenever I could for lunch and I cooked for myself on weekends. I also got a second opinion which revealed that I did not have asthma and I was being over medicated for something I didn't have.I have since weaned off the meds and moved from the dorms to an apartment. Now that I'm eating my own cooking I can even run like any other 20 year old. I've found that your diet can have a huge impact on your existing medical conditions. I hope you recover quickly! And I do not think there is a correlation between breathing and eating school lunches. That would be crazy! Jake was diagnosed with asthma a few years ago. Back then he was eating a lot of dairy. Turns out, he's lactose intolerant. As soon as I took him off dairy, the asthma pretty much went away. He doesn't even use an inhaler anymore. I've gone from eating a lot of prepared foods to cooking most of my own foods, and my asthma is far worse now than it's ever been. It's also the height of allergy season, and I've only ever shown a minimal reaction to dust. My allergist suggests that I don't have a reaction to individual pollens, but to the combination of pollens that exist in the air at a given time. That makes total sense to me, because every spring and fall, I become a mucous-y mess, and have sinus headaches like you wouldn't believe. I also need my inhaler for a good three weeks and can't walk or run any extended distance without it. I think that this varies from person to person, just like anything else. That being said, it *is* the height of fall allergy season, and things in my neck of the woods are awful. I'd like to take out stock in the companies that make Sudafed and Benadryl, even though neither of them are particularly effective for me. Hope you're feeling better soon, Mrs. Q! Interesting comments about asthma. I was just curious. Thanks! In regards to the nutrition being concentrated in the skin of a carrot…I have no doubt that there are properties in carrot skin that are concentrated and nutritious. The skin of a veggie is where the plant defends itself from intruders and microbes so there are naturally more defense mechanisms there. And a plant's defense mechanisms are really good for our bodies too! But to say that all the nutrition of a carrot is in the skin, well, I just couldn't find evidence of that on the internet. There were a couple of blogs that casually stated it, and more doctors (I know, don't always believe what doctors say…but you know I am human) that said that because the carrot is orange throughout that it is still full of nutrients. Not to mention fiber and that slightly sharp taste has to come from phytochemicals with something healthy in them! I am not sure it is fair to say that peeling a carrot removes ALL the nutrition. Though I have no doubt that it removes some. But I love that they are giving you guys carrot sticks. I do that all the time for my guys and they love them. It is the easiest vegetable we eat. And as a disclaimer, I don't usually peel my carrots except recently I have been getting some from the farmer's market that have been HUGE and very Very dirty, like I can't wash it all off. Those guys I will wash.
God bless you and your health as you get further into this school year!! Just so it's clear, when I said "a reader spoiled it" that was sarcastic. I love your input! I have allergies and asthma (have since I was born) I wanted to let you know that due to the weather conditions this year, that they are forecasting one of the worst years on record for hay fever. Don't be conservative about using your inhaler. The inflammation in your lungs will make it a trap for bacteria and you will wind up with bronchitis and pneumonia in no time flat. Use the tools available to you and take good care of yourself. The kids, your family (and your readers) need you! I'm a huge believer in the fact that what we eat effects our health. When I was eating a more processed diet I had a lot more health problems. Since moving to a much less processed diet I have a healthier immune system and more energy. We are what we eat. On the flip side, we are also effected by our environment. Schools may look "clean" but they have plenty of types of dust floating around in them which would effect anyone suffering from asthma. 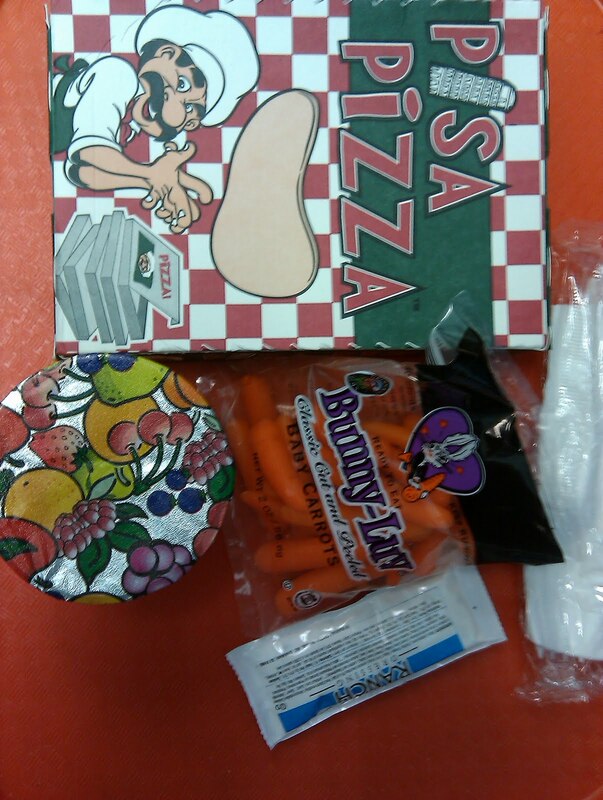 I say rejoice that the pizza was balanced with a little pkg of raw carrots! Too bad the fruit cup wasn't a fresh peach. My oldest daughter always had more asthma problems when school started back up, everything from fall allergies, dust, mold in the schools AND not so strangely riding the bus really messed with her allergies and asthma: open windows means no filtered air. I agree with Table of Promise about carrot peels. Sure, there might be a concentration of nutrients in the peel, but it's definitely not all of it. My kids eat carrots, but only peeled. The few times I've left the peel on they wouldn't eat them (and to be honest, I didn't like the taste either). But there is still good in eating a peeled carrot. Definitely better than not having veggies at that meal. In regards to asthma – I hope you feel better soon! I think it's complicated. The fact that you have a family history means you are probably prone to it and something can trigger it. Whether a bad diet can do that, I don't know though. But since the symptoms came up during the summer, when you had a few months off of school lunches, I'd think it's something else. Is the pollen worse than usual in your area maybe? I guess I'm in the minority, but I don't really care for raw carrots, but especially when they've been sitting in a package for weeks being transported across the country. I think it's much like eating cardboard –as tasty and dry. I would take celery over carrots any day. But somehow I don't think they can market "baby celery". Our school used to serve a pizza with 80 ingredients! And our pears had high fructose corn syrup in them. We posted all the ingredients to our school nutrition committee's blog last year (www.scsfood.blogspot.com) and this year these items are gone! Also – apparently there is a huge campaign underway to market baby carrots as "junk food" in chip-style bags. My brother had really bad asthma growing up. I remember when he would have horrible attacks and my mom would sit with him and talk to him and calm him down rubbing his back. Sometimes it would take 20-30 minutes, but his breathing would eventually stabilize, he would rest for 10 minutes and then we would all go back to playing outside. She hated giving him his inhaler because he had so many friends dependent on theirs and, much like Ritalin, docs gave them out like candy in the 90s. She never denied it to him, but she let him make the choice between using it or trying to work his way though the attacks with her. Even in high school when he had attacks he would go to the nurses and lay down for a few minutes instead of using it. Now, at 30, he doesn't even have symptoms anymore. I am really glad my parents didn't pop us full of pills and drugs like so many of my friend's parents did. I think we grew up with much better coping skills because of it. I have to say that I am concerned. I wasn't going to comment again today, BUT I am married to a medical professional who has asthma. If a child has been diagnosed with asthma and is having an asthma attack and not a panic attack there is no reason NOT to use an inhaler. In fact just sitting and being calmed down is not going to clear your airway so you can breathe. Asthma is serious, a child can die easily. If your asthma is triggered by someone's perfume then getting away from the perfume may help you to breathe better. If your asthma gets worse from allergens in the air such as ragweed, then talk with your doctor about allergy medication, a preventative inhaler such as advair and save the rescue inhaler for true emergencies. Asthma is a serious condition. Thousands of people die from Asthma every year in the USA. Interestingly, some children do outgrow asthma. My husband did. He was an athlete in college and is still very active. He is in his 50's now and his asthma came back when he was in his early 40's. I don't see how additives and preservatives that are put into processed foods cannot be correlated to food allergies and asthma. To me there is an undeniable connection. We didn't have so many food allergies when I was a kid (I was born in 1970). Food has changed so much over the years, for good and for bad. I don't know if this helps or not, but since I cut out all processed foods (most of the time), switched to sea salt, and upped my butter/coconut oil (removing veg oils), I often find myself waking up flat on my back and having no breathing problems at all. Before, I couldn't breathe for more than a minute or two on my back and had to sleep on my side. Hubs doesn't snore as much, and his not-breathing is less frequent. It can EASILY be the school lunches. Really the USDA doesn't control the salt? I mean obviously its processed food and that usually contains lots of salt but at my high school our salt shakers were taken away. We were told it was because we were getting too much in our diets. Salt suddenly became like an underground drug. Kids were passing cheap salt shakers and fast food packets all over. Ranch helped a bit but it was still hard to eat rubbery veggies without it. So I guess what I'm trying to say is I thought salt was regulated. I know that all water has some chlorine in it, but is there any way to find out the levels of chlorine baby cut carrots are rinsed in? I'd also assume that bagged lettuces that are "triple washed" are washed with a heavily chlorinated water supply as well, but is there any way to find out?